Ask a Bengali what in his/her bookcase does he/she treasure most? And the answer will be – the sixteen volume set of Rabindra Rachanabali, that is, the complete works of Rabindranath Tagore. Over the years, the works of Tagore has been one of the key source of revenue for Bishwabharati. However, after the expiry of the extended copyright, publishers were free to reprint Tagore without having to pay any royalty to Bishwabharati. 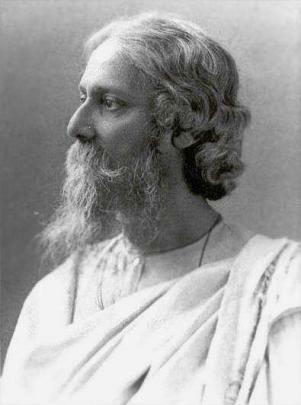 The Society for Natural Language Technology Research (SNLTR) grabbed this opportunity and made the entire published works of Tagore (Rabindra Rachanabali) available online through their website http://rabindra-rachanabali.nltr.org. No longer do you have to carry along with you the heavy volumes, neither do you have to spend money to buy them. Online Rabindra-Rachanabali is free. The website was released to the public on 27th January 2010, at the Kolkata Bookfair. According to Prof. Anupam Basu, the director of SNLTR who spearheaded this project, Rabindranath should be accessible to anybody and everybody who wants to read in Bangla. A professor at the department of Computer Science and Engineering of IIT Kharagpur, Anupam leads a series of projects to enable computing in Bangla. He and his team has developed Baishakhi, a unicode compliant keyboard that enables one to type in Bangla, and also enable web browsers to render Bangla in a clean and uncluttered manner. The entire Rabindra rachanabali project has been developed using Baishakhi and has been implemented by MAT3 Impex of Kolkata. The project had an initial seed funding from the Govt. of West Bengal, and had also received support from several organizations like IIT Kharagpur, ISI Kolkata, Jadavpur University, BESU, C-DAC, IBM and Microsoft Research, India. The Rabindra-Rachanabali site organizes the works of Tagore several categories, like poetry, songs, novels, short stories, plays, essays etc. It also provides an alphabetical index to search for a specific article. However the best feature is the in-built Bangla search engine, named Anweshan. It allows the reader to search Tagores writings using Bangla keywords. Keywords can be entered either using the Baishakhi keyboard, if you have one installed on your Windows PC, or you can use the virtual keyboard provided along with the search engine. I tried it few times and it works like a charm. Click the link on the left side bar titled “Anushandhan” and you can search to your heart’s content. The font (Bangla Academy or Vidya) layout and the text is also very pleasing to read. If you don’t have the fonts, you may download and install them by clicking the button on the left sidebar. One can move from one page to the other using easy to use navigation buttons. The site also allows you to report any typographical mistakes or any other issues via web based email. The site, however, does not allow you to print a whole story as a single file and you’ll have page one page after other. I’d like to request the developers to look into this useful feature. Another issue is that the articles (poems, stories) does not have the dates associated with them, like the way we see them on the printed volumes. Some links are not active yet (like “Prakalpa Sammandhe” or “Jogajog”), but I think they’ll be active soon. Kudos to Anupam Basu and his team at SNLTR for giving us this wonderful gift in this new year. Next year being the 150th birth anniversary of Tagore, this is a very well timed offering to the Bengalis all over the world. This entry was posted in Generic and tagged alphabetical index, anupam, Bengali, besu, bookcase, complete works, dac, department of computer science, govt of west bengal, iit kharagpur, impex, initial seed, jadavpur university, kolkata bookfair, microsoft research, natural language technology, rabindra, rabindranath tagore, web browsers, works of rabindranath tagore by sudipta. Bookmark the permalink. The Rabindra-Rachanabali project is of SNLTR. The digitization of contents (except Rabindrasangeet) has been carried out by the team from BESU (Prof. Indrajeet Banerjee and Prof. S.S. Barat)with technical help from Mat3Impex Pvt. Ltd. The Rabindrasangeet part has been digitized by the research team from SNLTR with help from IIT Kharagpur and rabindrasangeet.org (Prof. Baidurya Bhattacharya). The Swaralipi of Tagore songs is a unique feature of the project. As of now, we have experimentally put up about 100 Swaralipis. We plan to complete the entire Swarabitan by Ponchishe Baishakh. Please visit our stall at the Kolkata Book Fair 2010, where we will be demonstrating a Swaralip editor which allows one to write ‘aa- kaar matrik’ swaralipi and create e-versions of Indian music notes. To my knowledge this is the first such attempt. The system is a beta version and we plan the final release by Boishakh. We are also making available Unicode compliant USB bi-lingual keyboards (Bangla and English) based on Baishakhi layout. While we have worked on collaborative project with Microsoft-Research India on transliteration, the much desired collaboration with companies like IBM are yet to happen. We are planning to collaborate with Urhalpool for Unicode compliant productions.